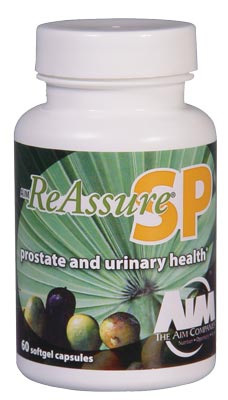 Traditional saw palmetto has been used for general wellness for the past 200 years, and recent research in relation to saw palmetto extract and prostate health has been extensive. The saw palmetto oil extract found in ReAssure SP is derived from the berry of the saw palmetto tree found in the southeastern United States. The extract is rich in fatty acids and phytosterols, which are a type of lipid found in plant cell membranes. AIM’s saw palmetto oil contains sitosterol and campesterol. These two plant sterols may block the absorption of cholesterol through the intestine . Many poor quality supplements use saw palmetto berry powder instead of the berry extract in order to keep costs down but, in turn, this alternative only provides a fraction of the benefits. As men age, they may experience inflammation of the prostate gland (prostatitis) or benign prostatic hyperplasia (BPH – non-cancerous prostate enlargement). According to figures from the Cleveland Clinic, half of all men will have symptoms of BPH by the age of 50, and that number increases to 80 percent by the age of 60. Although the exact cause of BPH is unknown, studies indicate that it may relate to testosterone’s conversion to a potent hormone called dihydrotestosterone (DHT). Overproduction of DHT has been linked to enlargement of the prostate. Saw palmetto suppresses DHT activity by inhibiting 5-alpha-reductase, the enzyme responsible for conversion of testosterone into DHT. Furthermore, the Journal of the American Medical Association reported that 320 mg a day of saw palmetto extract improves urinary symptoms as effectively as prescription drugs. ReAssure SP provides 320 mg of saw palmetto extract standardized to 85 percent fatty acid content per serving. Some European countries have been using pumpkin seed extracts to treat prostate symptoms because they contain ß-sitosterol (plant sterol) that inhibits DHT. This is a similar suppression to that obtained from saw palmetto. A study found that more than 80 percent of patients taking 300 mg of pumpkin seed oil daily experienced improvement in bladder function, stronger urinary flow, and reduction in the frequency of nighttime urination. The seeds also contain nutrients that can aid in bone health and ease the symptoms of arthritis. The pumpkin seed oil used in the ReAssure SP formula is pure virgin oil produced only by cold-press and filtration without using any solvents, additives, or other synthetic agents. ReAssure SP provides 240 mg of pumpkin seed oil per serving. Clinical evidence indicates that cancerous prostate cells contain less zinc than healthy prostate cells and that healthy men have much more zinc in the prostate than in other soft organs, such as the liver and kidneys. Although the reason for this is not clearly understood, zinc’s natural abundance in the prostate of healthy men suggests it is an important natural defense. Studies have shown that zinc inhibits 5-alpha-reductase (similar in action to saw palmetto and pumpkin seed extract) and the secretion of some estrogens (also linked to prostate issues). In addition to prostate benefits, zinc also is an essential component in the body’s enzyme process, acting as a stimulant for nearly 100 different enzymes. ReAssure SP provides 15 mg of zinc (as zinc citrate) per serving, which is 100 percent of the daily recommended intake. Lycopene, a carotenoid, may hinder the growth of prostate cancer cells. Harvard University conducted a six-year study of 50,000 men and concluded that those who ate foods containing high amounts of lycopene were up to 45 percent less likely to develop prostate cancer. As an antioxidant, lycopene helps neutralize free radicals that can contribute to prostate cancer and other cancers. ReAssure SP provides 5 mg of natural lycopene (from tomato extract) per serving. Take 2 capsules daily with food, a few hours before or after taking medications. Use for a minimum of three months. Do not use if you are pregnant or breastfeeding. Consult a health care practitioner prior to use if you are taking hormone replacement therapy, birth control medication, or blood thinners. Keep out of reach of children. Can ReAssure SP benefit women as well? Yes. The ingredients of ReAssure SP may have benefits for both men and women. Saw palmetto can promote urinary health by reducing bladder infections and improving urine flow. Saw palmetto may also increase female libido. Can I take ReAssure SP in conjunction with other AIM products? Yes, no limitations. Why must I use ReAssure SP for a minimum of three months? We recommend taking ReAssure SP for three months to experience all aspects of the formula. Some benefits will be noticeable within weeks. However, some benefits will not be fully achieved until three months of use. [1.] “Consumption of a Functional Oil Rich in Phytosterols and Medium-Chain Triglyceride Oil Improves Plasma Lipid profiles in Men” (Article (PDF)). Journal of Nutrition (133): 1815–1820. What is DHT and how it affect a man's health.